'Riverside', the Charles Schwab residence designed by Maurice Hébert c. 1902 on Riverside Drive between 73rd and 74th Streets in New York City. 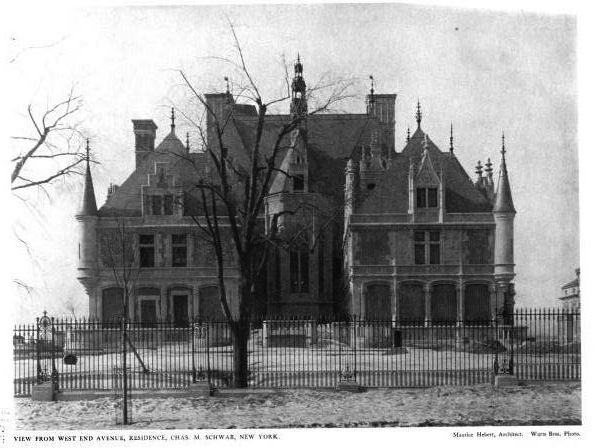 The house was demolished in 1948. Click HERE for more on the Charles Schwab residence. I hear Charles Schwab and his wife were both very down-to-earth and kind people...none of the snobbery that the gilded-age was know for.It was said he was as comfortable in a pool-hall as he was in an opera house. A shame the city didn't have the forethought to save this home. 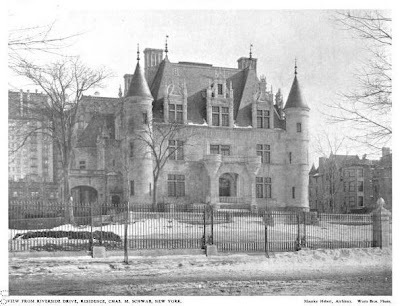 I see Acanthus Press is releasing "Great Houses of the Other Boroughs - Brooklyn,Queens, The Bronx, and Staten Island" in the Spring of 2013, although this is Manhattan...I wonder if this will be included. 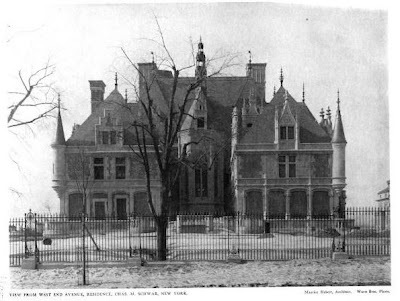 One of the most imposing, well sited, and beautifully complete chateau structures ever built in NYC. Very unfortunate to have Laguardia as the mayor at the time the home was offered to NYC as a possible Mayor's residence. It was a magnificent building. hmmm, a little Azay-le-Rideau here, a little Blois there, a soupcon of Chenonceaux, and pretty soon you're talking real house. One of the first gilded age houses to get my attention when a wee tot, and still pretty amazing.